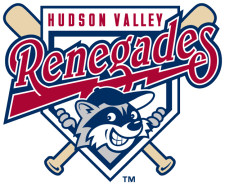 The Hudson Valley Renegades tried to rally in the ninth, but the rally fell short as they lost 8-6 to the Brooklyn Cyclones on Tuesday at Dutchess Stadium. Brooklyn took the lead in the top of the first. William Cherry drove home two runs with a double to left, giving them a 2-0 lead. The Cyclones added to their lead in the fourth inning. Rylan Sandoval drove home two runs with a single to right. Darrell Ceciliani then doubled to score Sandoval. Cory Vaughn drove home Ceciliani with a sac fly to increase the lead to 6-0. The Renegades got their first run of the game in the fifth. Steve Tinoco singled to center then later scored on a ground out by Alejandro Torres for the first run. The Renegades added three more runs in the next inning. Derek Dietrich and Phillip Wunderlich delivered back to back singles to put runners on base. Nicholas Schwaner followed with a double to score Dietrich. Tinoco then drove home Wunderlich with a ground out to second. Robby Price plated Schwaner to pull the Renegades to within two, 6-4. Brooklyn struck again in the ninth. Vaughn led off the inning with a solo home run to center. Joe Bonfe later hit an RBI single to increase their lead to 8-4. The Renegades tried to rally in the bottom of the ninth. Singles by Price and Torres followed by a walk to Craige Lyerly loaded the bases. Dietrich and Wunderlich would both drive home runs but they left runners the tying runs stranded and took a 8-6 loss. Julius Dettrich suffered the loss, pitching 3 1/3 innings and allowing 4 runs on 5 hits with a strikeout and 4 walks. Nate Garcia pitched 2 innings and allowed 2 runs on 3 hits with a strikeout and 2 walks. Kevin Chavez pitched the final 3 2/3 innings, giving up 2 runs on 4 hits with 5 strikeouts. The series concludes on Wednesday night at MCU Park in Brooklyn.